I ate here the other day on the spur of the moment while I was running some errands with my mother at the Fashion Show Mall, we decided that we were hungry and wanted to give this place a try since it is kinda new to the mall. They are located across from Nordstrom and right next to the fashion runway. Upon entering we were quickly greeted by the hostess and one of the on duty managers. They got us seated right away went over the wine/beer lists and the special pizza for that month. I have to admit that at first glance at the menu I was a bit disappointed that they didn’t have more of a selection. I enjoy going to pizza places that have a few specialties created for you. It always seems to help me personally decide what I want on my pizza. Here you start with your size pizza and go from there. They have personal (12″), small (16″) & large (18″) then you add your toppings which are priced from $2-5. You can download their menu here if you would like to see their offerings. I will admit I had a bit of sticker shock; now as a local in Las Vegas you are aware that prices on the strip tend to be higher than off, it is just part of the territory you go with it. But for some reason the cost of things seemed a bit unreasonable, especially when you are building your own pizzas, your cost per pie can skyrocket if you’re not careful. A personal pizza with just cheese is $9, you add 4 toppings your pizza just became a $17 pizza. Because we were kinda taken aback about the prices we actually considered leaving but had already ordered our drinks and that seems rude to just order a soda and leave, and I am sure this wasn’t the best mind state to be in when you haven’t even ordered yet. After some debating we decided that we would split the large antipasto & the special pizza which was a spicy buffalo chicken pizza in the small size. 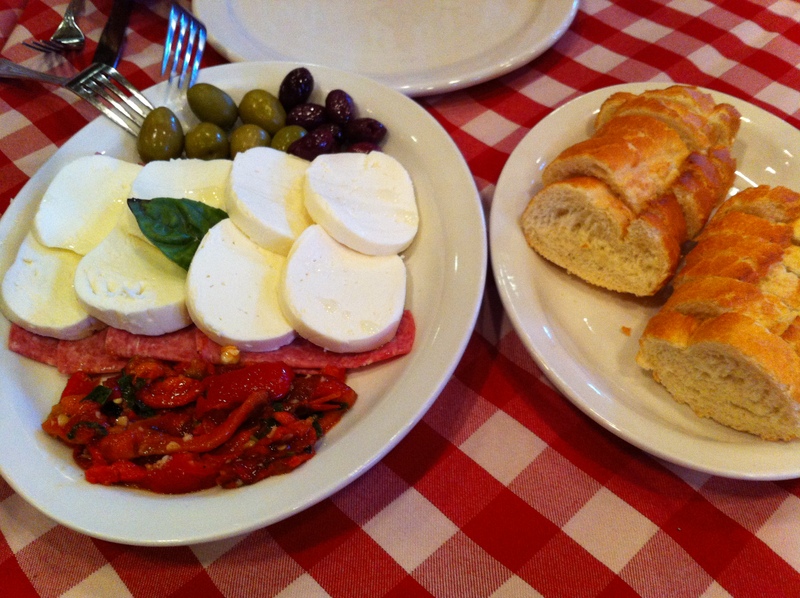 The antipasto came with fresh mozzarella, oven roasted red peppers, Genoa salami, olives & fresh baked bread for $12. We did ask if they had butter for the bread, and were told that they do not have butter in their restaurant, kinda disappointing but not something that is really going to ruin my meal. They did have oil & vinegar on the table, but no additional plates to put it on so I had to poor it directly on my plate which was messy or right on to the food. To me the best part of this dish was the bread & cheese, but truthfully it was missing something. We couldn’t quite put our finger on it but something was off. About half way through the plate our pizza arrived, we were offered clean plates, but decided against it and the waitress served us our first piece. Which is why the pizza below is missing slices. 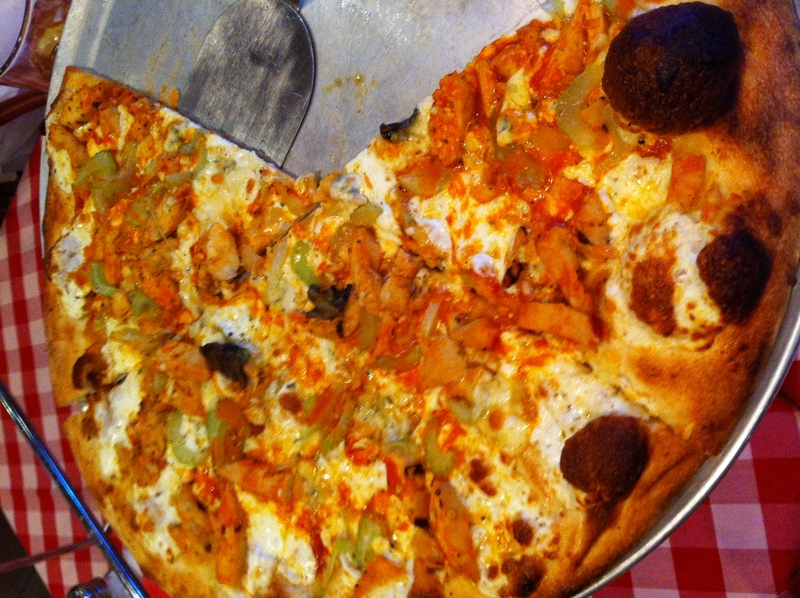 The spicy chicken pizza, had celery, Frank’s Red Hot, bleu cheese crumbles and mozzerella cheese. This pizza was good, but I have had better, it was bland even with the hot sauce. You couldn’t even taste a single bit of bleu cheese. I even asked the waitress if they had some bleu cheese dressing so that I could dip my pizza, she said no the only dressing they have is caeser dressing. I did like the thin crispy crust, which they achieve from baking their pizzas in the brick oven, the bottom of the pizza did have ash on it so your finders get this gray coating on them and taste burnt if you lick them. I truthfully have had this same spicy chicken pizza and it was better pizza just across the mall at California Pizza Kitchen. Overall the food was just OK nothing special, it certainly would not make me want to hunt this place down under the Brooklyn bridge from which they say is what made the bridge famous; their pizza. The service started out good, but slowly drifted to bad as the meal progressed. I was not offered a refill of my drink yet my mother’s ice tea was filled without question. We sat waiting for our bill for awhile because our waitress was having a deep conversation with an on duty manager and fellow waiter, so we had to sit and stare in to the kitchen to get someone’s attention which did not work she just looked around me, and when there is only 4 tables with people at them and they are all sitting in a row does not make it hard to miss that I am trying to get your attention politely. We eventually had to wave and yell to them for the check because they would not leave the area to come on the floor, which of course immediately brought over a busboy and our waitress and shortly after that the manager with our bill. I would think the manager would’ve made a slight apology for the wait but nothing he just set the bill on the table and that was that. Only as I was paying the bill was I asked if I would then like a refill on my soda. Our total bill was $40 even, were $20 of that was just the pizza. While I do not mind spending money on eating out I want to feel like I got my monies worth when I do and here I did not. So truthfully if you are feeling like having pizza while you are in the mall, I suggest you skip this place and head over to California Pizza Kitchen, you will get more choices and flavor for what seems like a better deal or even head to the Nordstrom Cafe where they only have 3 choices for pizza but still seem like a better deal.